When I awoke on Sunday, if you’d have told me that by mid-afternoon I’d be holding a gun to my wife while watching someone perform First Aid on a snake, I would’ve said you were crazy. Then I would’ve asked what the heck you were doing in my bed. The day actually started off pretty normal. After church and breakfast, we all headed to The Animal’s soccer game. Then on the way home we stopped at our friend Adam’s house to visit with him and some friends. I figured we’d be relaxing on their back porch, maybe sipping on iced tea, and just enjoying some good old-fashioned Sunday conversation. But when we got there, we found everyone in the dining room in the middle of a heated game of Cash ‘N Guns. If you’ve never heard of this game before, imagine Tarantino’s “Reservoir Dogs” as a board game, just without all the gratuitous blood. The main part of the game involves the players pointing foam guns at each other in a kind of inner-gang Mexican standoff. Tiddlywinks it is not. Now, anyone who knows me knows I hate games, especially board games. Call me a party-pooper, but just the mention of dice and/or cards sends me running for the hills. I blame it on my seconds-long attention span. 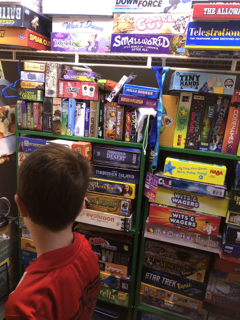 Adam, however, is a board-game junkie and had a closetful to prove it. There was enough board games in there to keep me bored for eternity. That said, I was a guest at his house, and I wasn’t about to be rude. 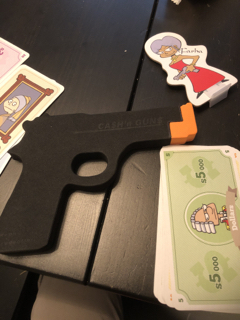 So I sat down at the table and within minutes found myself pointing a foam handgun at my wife, meanwhile staring down the nonexistent barrel of at least two other fake firearms. I gotta tell you, it’s amazing how unsettling it is having a toy handgun pointed at your head. But, hey, we were having fun! At one point during the game, Adam’s oldest son came in holding a wounded garter snake he’d found in the backyard. 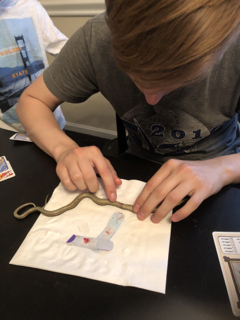 So while I pointed my fake weapon at Boogieface, I watched as the boy sat at the dining room table applying Neosporin and a bandage to the suffering serpent. You know. Just your normal Sunday afternoon. Finally the game of pretend-like-you’re-shooting-your-loved-ones-and-friends came to an end (thank goodness). My friend and fellow game-hater George and I headed outside for some fresh air, where we discovered a couple Red Ryder BB guns. (Score!) So as the games continued indoors, we enjoyed a little target practice in the rain. Heck, we even let The Animal take a few shots and, miraculously, no one got their eyes shot out. When we walked back inside, Adam and the others were smack in the middle of some other game, so George and I snuck into the living room where it was somewhat quieter. 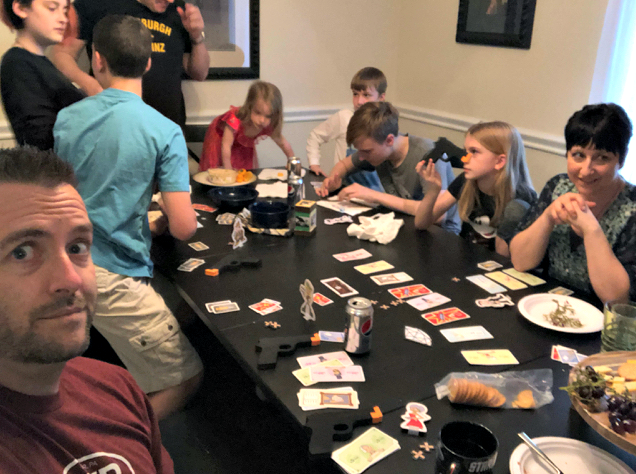 Then, just when I was getting my hopes up that game day was coming to a close, the volume in the dining room reached the ear-splitting level as the gamers engaged in a game of Happy Salmon, a.k.a., the Loudest Party Game Ever Invented. Basically, it’s like the floor of the New York Stock Exchange if it were a game. Just way more chaotic. Eventually, mercifully, it was time to go. So, ears ringing, I thanked Adam and his wife for their hospitality, bid adieu to his kids and our friends, and then made a beeline to the car before anyone could pull out Monopoly. ‘Cause, you know, it was only a matter of time. 2 Responses to "Sunday Not-My-Kind-Of-Funday"
My grown kids and I love board games, so I’m jotting these two down. Right now we’re loving Mysterium and Bring Your Own Book and Codenames. I mention these so you can add them to your list of games to avoid. You’re welcome. By the way, we long since gave up playing Clue with my son Christopher, because he kept a spiral-bound notebook full of every single thing the rest of us did throughout the game, meaning he won nearly every time. We might not have minded so much, but the gloating and head-swelling were just a bit too much.